Get the best of both worlds and change the way you think about heating with Daikin Nexura. 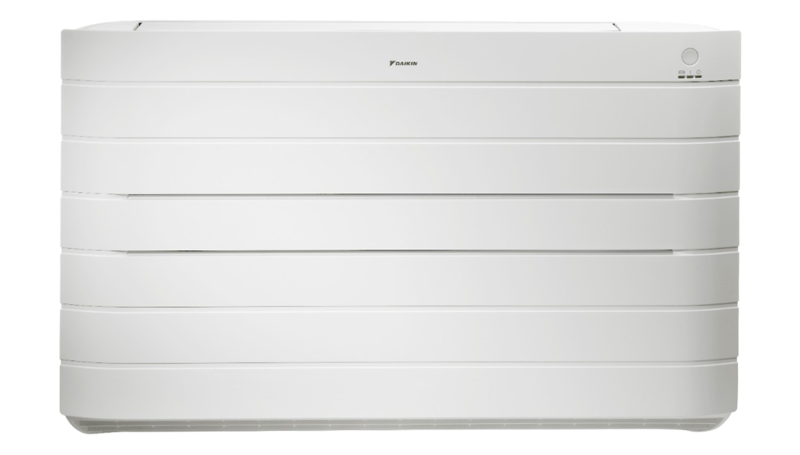 Using the state-of-the-art technology and efficiency you'd expect from a Daikin, not only does the Daikin Nexura floor standing air conditioner offer the best of both heating and cooling as well as comfort and design, its best feature is a hidden one; the front radiant panel also heats up to give you that unique familiar comfort of a traditional warm radiator. Engineered in Europe it also has a modern design that blends in seamlessly with your home's decor to turn any room into a haven. Powerful heating mode rapidly circulates warm air throughout the room to reach the set temperature. Aluminium front panel warms up like a traditional radiator for that comfortable and nostalgic feeling that keeps you warm and comfortable. Increased airflow circulation combined with heat radiating panel for rapid room warm up. Gentle airflow combined with heat radiating panel for a draught free, quiet heating experience. Aluminium panel connected to a sub heat exchanger enables radiant heating with panel surface temperatures of up to 55°C.